If you were a boxing fan in or around Springfield, Massachusetts in the late 80s-early 90s, you knew exactly who John Scully was. Hailing from right down the road, across the Connecticut border, Scully was known to train in Springfield and was the shining star of the area scene. Scully wasn’t just a local fighter, he was a local fighter with a bright future. Back then, such things meant something – just as they do now. Sure enough, Scully went on to quite the successful career at light heavyweight. Nowadays, Scully, also known as “Iceman,” is a trainer of high note, yet he’s also known for something that’s perhaps even more important…helping out former fighters in need. 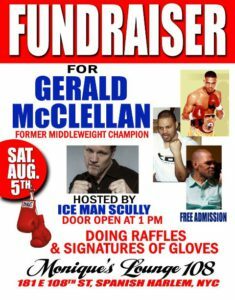 On August 5th, Scully will be hosting a benefit for Gerald McClellan, an amazing middleweight champion from the 90s who suffered permanent brain damage after a brutal fight with Britain’s Nigel Benn in 1995. “Gerald and I were amateurs together back in the 80s,” says Scully. “I’ve been in touch with his sister(s) and they take care of him at home all on their own.” Sure enough, McClellan’s siblings have taken responsibility for their bother’s well being. Needless to say, such an endeavor can be quite costly. Boxing is the greatest sport on earth, not only for the brilliance that can be seen regularly in the ring, but oftentimes for what transpires outside of it. Thanks to men like Scully, fans will be able to take part in some of the brilliance that takes place outside of it this summer. The Fundraiser on the fifth of August won’t only be fun, it will be for an absolutely terrific cause.